Traditional in appearance, a single hung window slides vertically, reminiscent of a classic-style sash window. Since it opens without using any interior or exterior space, it’s an excellent choice for small rooms or next to walkways, porches or patios where you don’t want a window to protrude. On a single hung window, only the bottom sash slides upward—the top sash is permanently fixed. Screens are usually installed on the outside of the window. 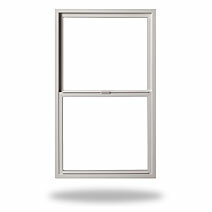 On single hung tilt windows, the bottom sash tilts inward to enable cleaning of the exterior face. Single hung windows can be an effective design element for ventilation when combined with picture or arch/radius windows. They’re frequently used in bedrooms, bathrooms and many other rooms in a house.